I’m on a serious health kick lately and I’m generally speaking eating a low carb, high (healthy) fat diet. I figured I would share some of the recipes I’ve been making. I already posted one of my go to low carb desserts a few weeks ago and today I’m back with a staple dinner that actually tastes like the real thing (some of the mock low carb dinners really don’t, lets be honest). 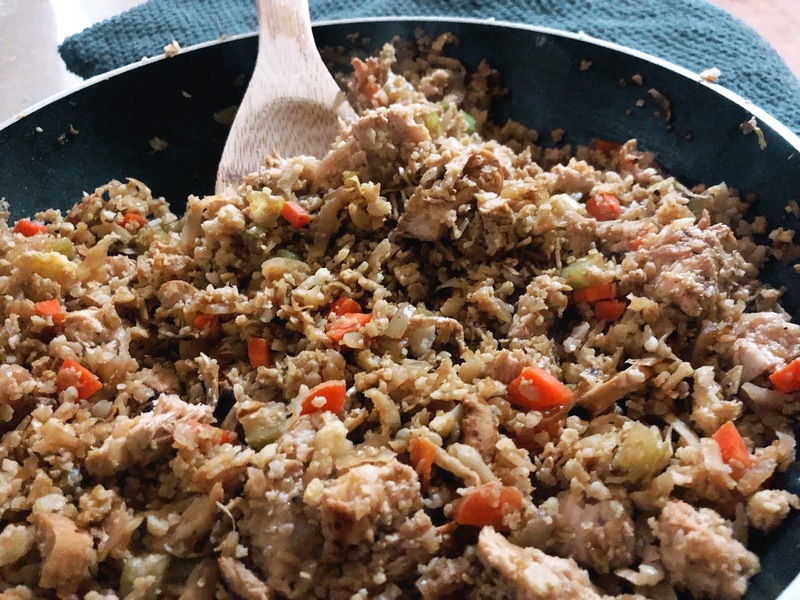 I made this Chicken and Cauliflower fried rice a couple weeks ago now and when I posted it on my personal Instagram, a bunch of people asked for the recipe. The thing is… I kinda made it up as I went along. Not to worry, I recreated the recipe (and the original photo) and I have it here for you today. Now, I’ll be honest and say that I’m actually not the biggest fan of cauliflower. I grew up despising the taste of cauliflower and its the one veggie I routinely gave trouble to eat as a kid. Sorry mum if you’re reading. I can’t eat it boiled, steamed, grilled or in any way where I’d taste it too much or feel the texture. Basically for me to like cauliflower it has to be as far away from a cauliflower as possible. I’m clearly not on the ‘cauliflower is the new potato’ bandwagon … I much prefer broccoli and zucchini and reach for those more often than not. 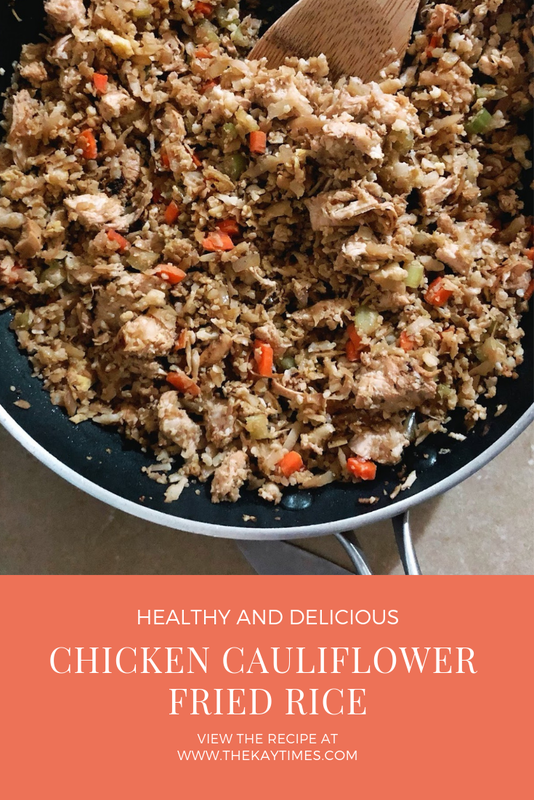 I would never have guessed I would like any cauliflower dish but I got a game changer with this Chicken and Cauliflower fried rice. And if I like it, I can imagine lots of people, (kiddos included) will too. I prefer this recipe steaming hot but it tastes good reheated as well. Place the thawed cauliflower in small batches in a food processor. Pulse in short bursts until it looks like grains of white rice. Once you do that, place the riced cauliflower in a tea towel, or nut milk bag, and squeeze until water has been removed. 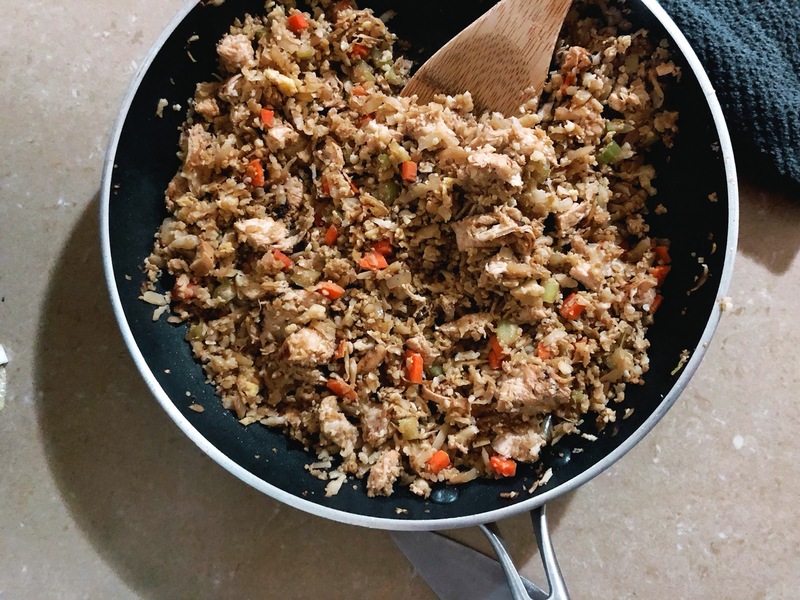 Theres also another way to rice cauliflower which I use a lot. Grate the cauliflower using a regular grater on the largest side of the grater. The cauliflower comes out perfectly riced and there is no need to squeeze the water out. Set aside the cauliflower no matter which method you use. In a large, nonstick pan, heat the coconut oil over medium heat. Sauté the diced onion, until translucent (about 3-4 minutes). Add the garlic, and continue to sauté for another 2 minutes until the garlic is fragrant. Add the dried, riced cauliflower, then the sesame oil and soy sauce and mix to combine. Add the carrots and chicken and mix gently to combine. Cook for another couple minutes, or until the carrots are a bit soft. Create a space in the center of the pan. Turn up the heat to medium-high and allow the cauliflower mixture to cook undisturbed for 2 minutes. Add beaten eggs to the center of the pan and, stirring occasionally, scramble the eggs. Mix the scrambled eggs into the rest of the fried rice. Once the eggs are scrambled you can serve immediately.